The Bamberg Apocalypse was commissioned for the Holy Roman Emperor, Otto III, although it was not completed until after Otto’s death. The manuscript was produced in the scriptorium at Reichenau and contains the text of Revelation accompanied by fifty-seven illuminated images. This image, of the New Jerusalem, is typical of images throughout the series: uncluttered, even sparse, but effective at conveying both the narrative and the essence of Revelation. By removing all extraneous detail, the Bamberg artists focus the viewer’s attention firmly on the interaction between the angel and John, front and centre in the image. 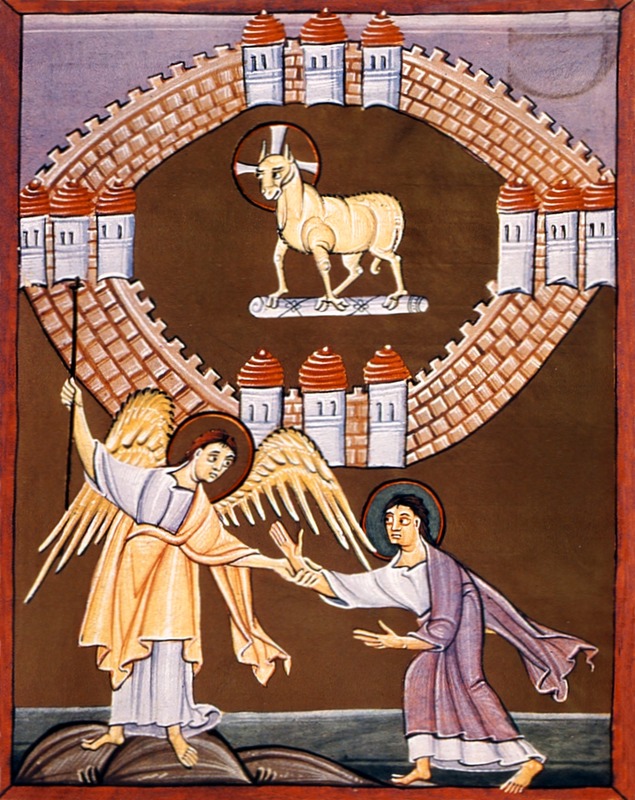 The angel appears to be pulling John up from his feet (in Revelation 22 John falls at the feet of the angel, attempting to worship him rather than God/Christ), while giving him the measuring rod with which he measures the New Jerusalem in Revelation 21. The art historian Frederick Van der Meer has drawn attention to the ‘shifty’ eyes of the main protagonists in the Bamberg series, suggesting that they convey a haunted quality. Here the focus is not so much on the New Jerusalem, which stands sparse and empty in the background, but on John. He appears here at the end of his visionary journey, wide-eyed with amazement at all he has seen. The Lamb (Christ) dominates the city of Jerusalem, cutting a rather lonely figure at the centre of the seemingly deserted city—at odds with the description in Revelation 21, in which it is filled with people from all nations. Visual priority has thus been given to John, perhaps at the expense of the city. The image stands as a fascinating counterpart to more conventional visualisations of the city of the New Jerusalem.